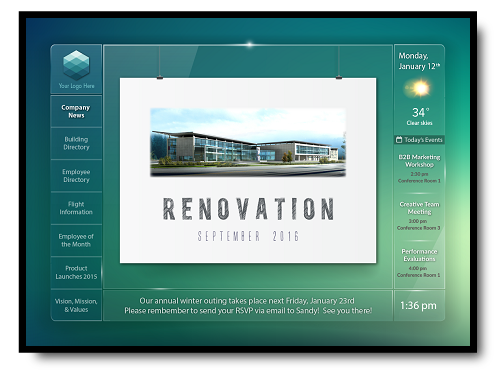 Empower your workforce with real-time digital signage. The manufacturing industry is in the midst of a revolution, transitioning towards greater automation and accelerated production. Maintain your competitive edge. Provide real-time data insights and drive employee engagement with our unique cloud-based technology. ITS manufacturing display solutions allow you to define and measure progress towards company initiatives. Spot and address problems as they happen, before they become larger problems. Even align your workforce to meet goals, improving the production quality, speed, and overall efficiency of your operation. Meanwhile, digital display technologies like CCTV and employee messaging also allow you to maintain a safe working environment for your team. Our multimedia solutions promote content sharing across all directions of your organization, ensuring continuity and driving company-wide engagement. Whether it’s signage in factories or displays for manufacturing management, ITS can provide individual products or a full customized system to meet your specific needs. 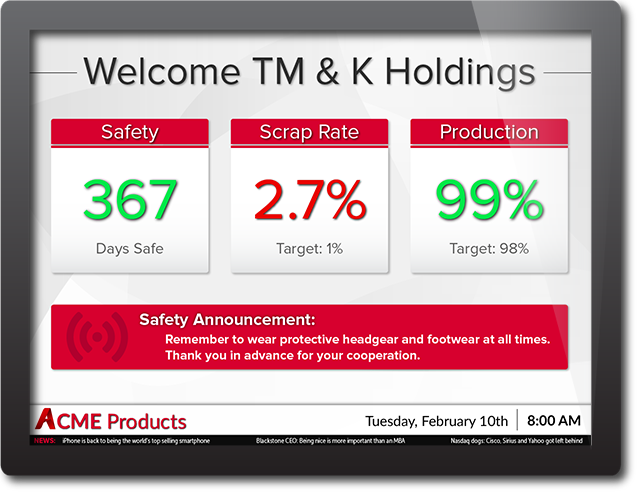 Our offerings help to bring real-time data to your industrial setting, and the quality of our digital signage displays is coupled with first-rate service throughout all phases. 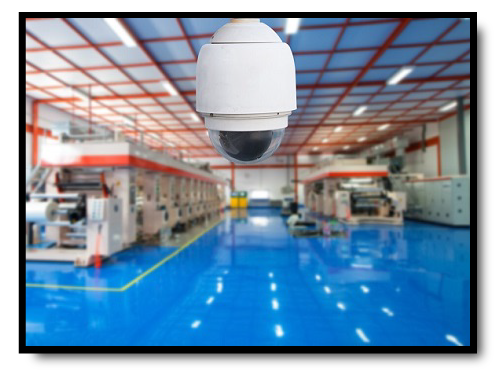 CCTV/ Digital Vision solutions allow you to monitor and record operational processes at key, critical locations. Aside from supplementing existing security measures, the recorded video is also useful in marketing campaigns, employee training & safety reviews. Our Corporate Messaging System seeks to distribute content uniformly, across each of your locations. Communicate the information vital to your operation. Encourage participation in company initiatives, showcase progress towards goals, enhance emergency preparedness, and more. 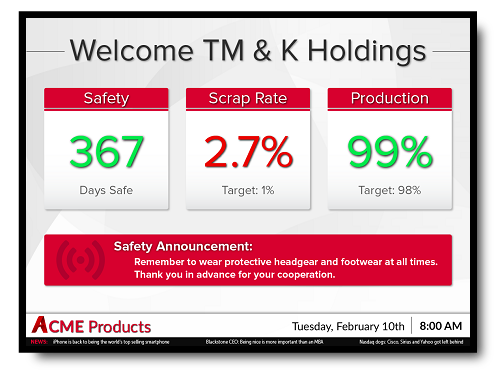 KPI & Metrics Displays present all measures critical for success in real-time. Recognize areas of high performance. Monitor how many days the facility has been incident-free. Even identify problems as they happen, and align your workforce in response. The Shipping Status Board allows you to track orders with ease, monitoring all of your shipments in real-time. Eliminate unnecessary hassle for your employees, allowing them to concentrate on other operational needs. 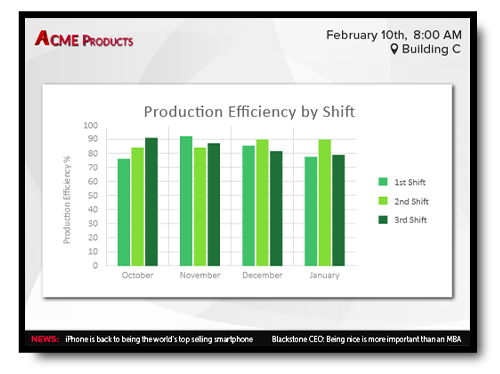 Boost efficiency, free up resources, and save your company time.